Oak Bay is often considered the community that most exemplifies the Victoria lifestyle with its beautiful homes, famous gardens and tastefully quaint shops and fine restaurants. British traditions and influences are readily apparent and range from architecture to accents to pubs to a quiet and peaceful pace – so much so, as matter of fact, that residents are often teased about living behind the “Tweed Curtain”. Located east of downtown, it has a beautiful coastline overseeing both the Strait of Georgia and the Strait of Juan de Fuca and is home to the well known Victoria Golf Club, the Royal Victoria Yacht Club, the Oak Bay Marina and a number of Very fine private and public schools. 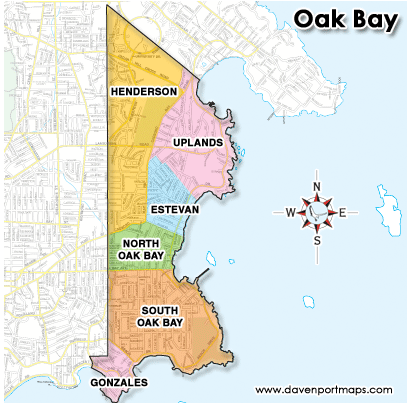 Some of the city’s most impressive homes and estates are located in Oak Bay but the water views and Gary Oak tree shaded streets make all of this municipality a first choice for peaceful ambience no matter what price range of home one might be considering. Whether poking around the antique shops or browsing the bookstores or library, taking tea at the Blethering Place or sitting at a sidewalk café like Ottavio nibbling a fresh baked treat or just driving home through tree lined streets to peace and quiet, Oak Bay has it all and offers it gladly and generously. Gonzales Beach is Victoria's Malibu with spectacular views to the Southwest of the Olympic Mountains in Washington State. A crescent-shaped beach on a sheltered bay five minutes from downtown. Check out this short video - Aerial Views of South Oak Bay, King George Terrace and Gonzales Bay. The largest population in Greater Victoria can be found in Fairfield. The area is mainly comprised of single detached homes and small apartment buildings. Fairfield is right beside Downtown Victoria and is at the southern-most tip of the city. To the east you can find the Oak Bay Neighbourhood, and to the south the beautiful shoreline of the Strait of Juan de Fuca. Cook Street Village is located in the Fairfield area and is home to many shops and local stores. You can find some of Victoria's finest restaurants in the Fairfield area as well. 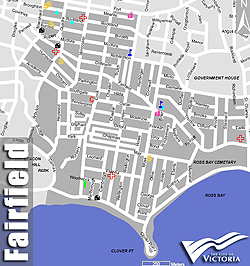 The Fairfield Medical Treatment Center and the Ross Bay Pub are also in the neighbourhood of Fairfield. James Bay, Downtown, Fairfield, Rockland, Fernwood. 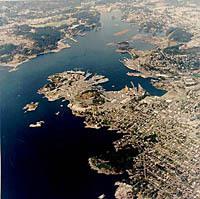 Esquimalt is located just to the West of Victoria and contains a Marina and many parks. Some of the notable neighborhoods and key Real Estate areas are Saxe Point, Rockheights and Parklands. Canadian Forces Base Esquimalt is a major employer in Esquimalt and employs over 7000 people. The English Inn Resort is a beautiful place to visit while in Esquimalt, click here to visit their official website. The District of Saanich is divided into two halves East to West. The District of Saanich houses the very notable University of Victoria and also contains 170 recreational parks. The District of Saanich has a vast bicycle path system and is very accessible. Don't miss the great golf courses The District of Saanich has to offer at Blenkinsop Valley, Cedar Hill, Cordova Bay and Prospect Lake golf courses. As to be expected there are some great neighbourhoods in The District of Saanich, some of the most notable areas are Gordon Head, High Quadra, Broadmead, and Cordova Bay. Click here to view the most recent Real Estate blog entries!